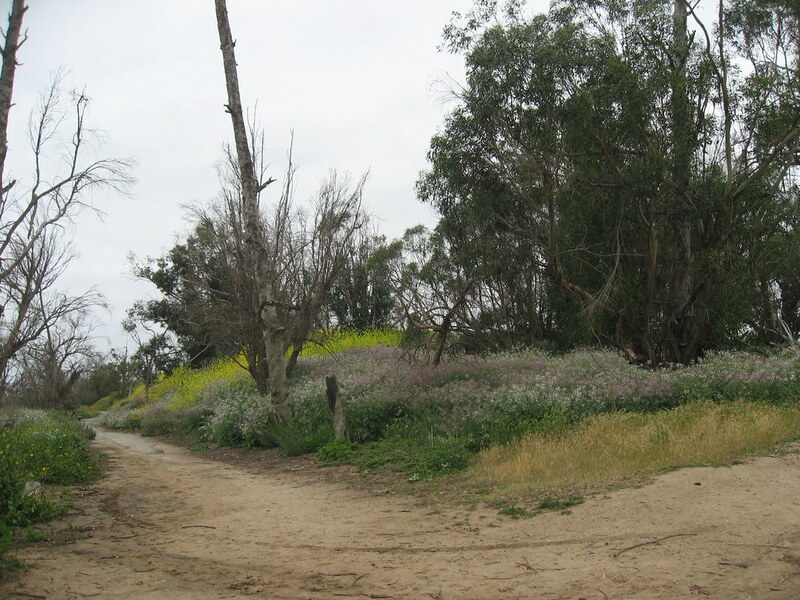 The Green Girl met up with the Sole Runners for our last Saturday morning run at the Bolsa Chica Ecological Reserve. Our summer season will be starting next weekend and we'll be training out of Long Beach. As I was heading southbound on Pacific Coast Highway, I saw some of the Ragnar Relay runners. 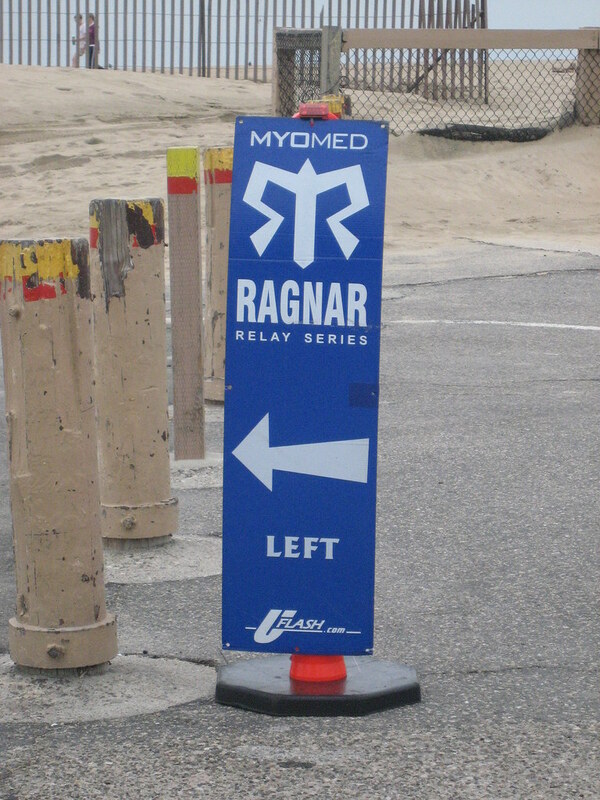 The Ragnar Relay is a 200 mile relay from Ventura to Dana Point. There were orange cones to warn drivers of the runners in the sections where there was no sidewalk. I also saw a handful of signs that warned 'RUNNERS ON ROAD'. On our run, we chatted about the Ragnar Relay. A few of our teammates had registered and we were wondered how they were doing. 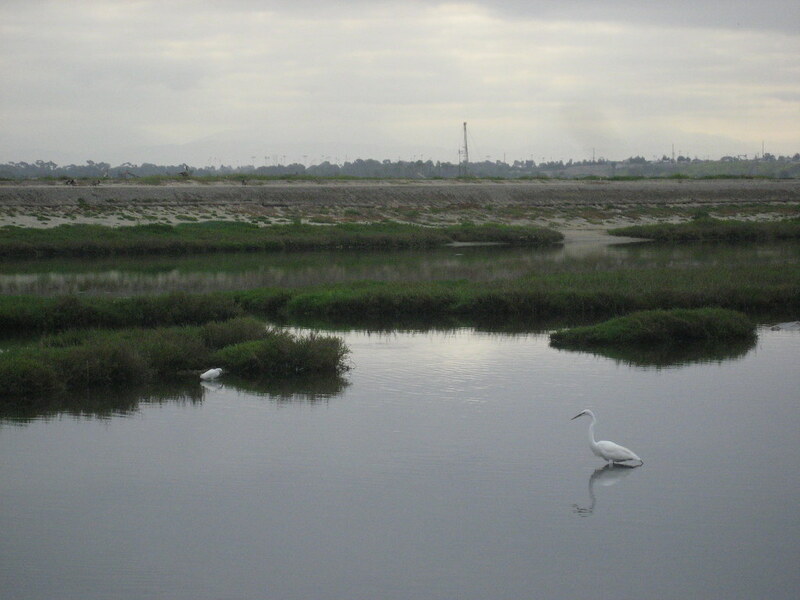 The sky was overcast and the air was muggy but the beauty of the wetlands still shined through. Surprisingly, there were more bird watchers with their giant hunting camouflage telescopes out than usual. I feel like the trail running has made me a stronger runner. I'm a clumsy Green Girl but since I started trail running, I trip and stumble a lot less. I believe the uneven ground has also helped strengthen my ankles. Even though I took it easy today, it was a satisfying last mid-season run. After working up an appetite on our run, we stopped to get some breakfast. It was cool because we got to see the Ragnar runners as we walked up Pacific Coast Highway. We also opted to sit outside and eat so we could watch the relay go by. We all got a good chuckle as the different team vans drove by with the clever names plastered all over the body of the vehicle. We saw a fake torso with a lacy black bra and a team called 'I think I've made a huge mistake'. Heh. One of the highlights was when we spotted a fellow Sole Runner running by. I saw a Sole Runner's van out there where I was! For what it's worth, I think trail running does a lot to not only strengthen us physically, but mentally as well. I know I have to pay attention all the time to make sure I'm putting my feet in the right place at the right time. Remember the old saying in trail running: "If you look up you're going down!" By the wy- if you're interested, here are the Ragnar pics at the last runner exchange. Thank you so much for sharing your pictures! I was so disappointed that I didn't have my camera with me. And thanks for getting all those Sole Runner shots - I sent my coach a link to your stream. You know the funny thing is that I almost always look where I walk/run because I'm such a clumsy person. I didn't realize how unusual this was until I start running with other people and I would always notice dead animals, poop, etc. One day, one of the other runners commented that I'm always the first to spot things. I assumed everyone watched where they stepped all the time! Heh. :) It seems like we all got a taste of the Ragnar racers! I need to start trail running. I also want to do the Ragnar Relay someday, but it will probably have to wait a year or two. I was really intimidated by trail running at first but once I mustered up enough courage to give it a try, I fell in love. Which Ragnar are you thinking of doing?